While trademark registrations are not likely the first casualties we think of when we hear about war – or the second, third or hundredth – they are one of the many things that become unavailable during such a crisis. 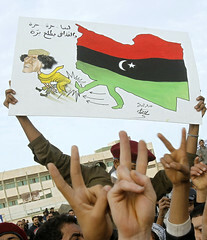 Libya’s trademark office was closed for over two years, from February 2011 until April of this year. The attorneys at NJQ & Associates inform us that the office is now fully up and running again with the first filing of a trademark renewal application. There were likely many trademarks that expired during the office’s closure. The office is now accepting renewal applications for marks that expired during the office’s closure as well as those coming due through next year. If you are responsible for marks registered in Libya, it would be a good time to check on their renewal needs. Full NJQ & Associates newsletter here. Photo: libya-protests_042 CC-by-nc-sa Crethi Plethi available at Flickr.